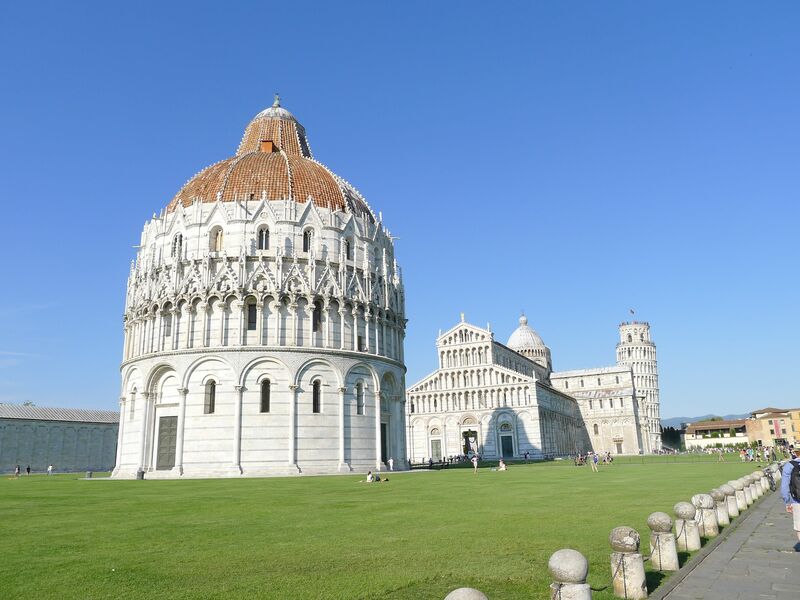 Pisa has been set on our calendar for some time as the celebration of the city’s patron saint, San Rainerius is celebrated on my birthday, June 16th. The city lights 70,000 candles to honour him. So I figured, why not? It all sounded so magical. Lucy was fairly choked about this, because it was like my birthday was mirroring the story line of “Tangled” and she felt that this should all be happening on her birthday. Well, that is where the magic ended I’m afraid. 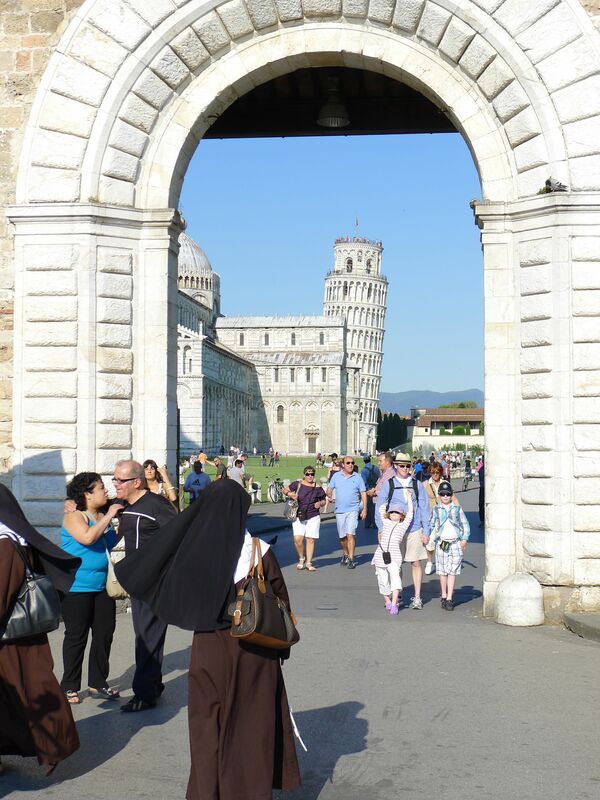 We rolled into town, found parking and made our way in though the walls to the grounds of the Leaning Tower, the Duomo and the Baptistry (otherwise known as the Campo dei Miracoli). It is shockingly beautiful and incredibly immaculate. The tower is much smaller than I thought it would be and depending on where you are standing it appears to lean in more than one direction. I didn’t notice this until after I was looking at my photos of it. There is some disappointment among the younger ranks as we soon discover that children must be at least 8 to climb the tower. Since the line appears to be stagnant, we elect to carry on toward the Arno River to see if any of the candles are yet lit (it is now pushing 7 and the celebration is meant to start in less than an hour). I think we chose the equivalent of Yonge Street during the Santa Claus parade as our route to the river. It couldn’t have been busier and the walk took forever through huge crowds and street venders selling everything you have absolutely no use for. In case you are not aware, crowds are not Chris’ strong suit, so as the endless journey to the the river continued, everyone’s spirits diminished. We were all tired and hungry. When we finally emerged, there really wasn’t anywhere to eat. The city appeared to be just beginning to install the 70,000 candles onto the walls of the building lining the river, so it looked like there wasn’t going to be any candle lit walk happening any time soon. After a brief pow wow, we elect to leave the river in search of food. The candles will have to be enjoyed by the other 200,000 people who have come to see them. In the end we eat at a less than appealing place because it was there. 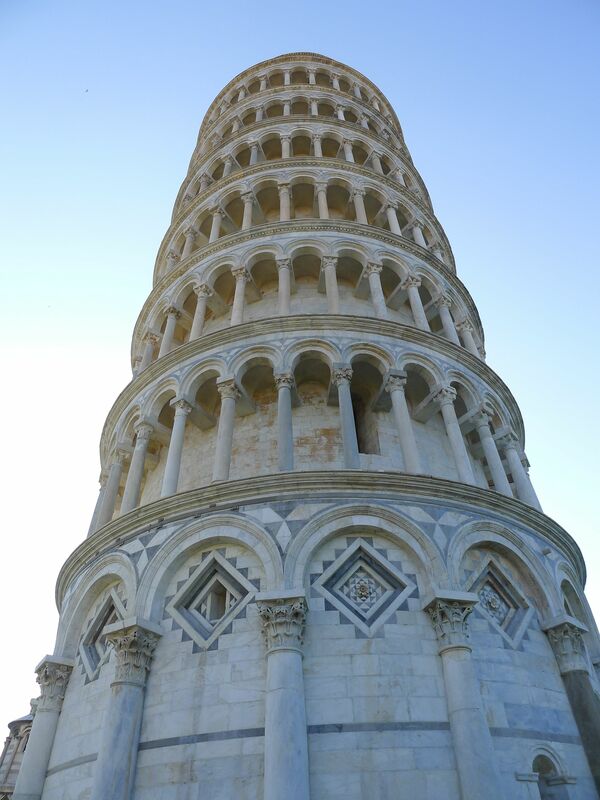 We leave Pisa feeling disappointed and tired and finally reach our villa well past the kids bedtimes. I am glad that we went, despite everything. The tower is a wonder and it was worth the price of admission into an otherwise filthy city covered in graffiti. It seems that the city officials have figured out the the tower is where their bread is buttered, so the lawns surrounding it are utterly immaculate. But directly across the street is a virtual ghetto and that is pretty much what the rest of the city looked like. I think we should have stayed in Lucca for the day!